This was predicted. Not the exact detailed description of what was an early candidate for fight of the year between defending WBC heavyweight champion Deontay “The Bronze Bomber” Wilder 40-0 (39 KO’s) and undefeated contender Luis “King Kong” Ortiz 28-1 (24 KO’s). More so, the bigger picture and potential prophecy unfolding in front of our eyes. The late Emanuel Steward was on to something when he predicted the future of the heavyweight division before his untimely passing in 2012. “There’s one kid in America no one speaks of and that’s Deontay Wilder. He was on the Olympic Team (United States) he lost but he’s a big kid,” said late legendary trainer Emanuel Steward. The fight itself far exceeded expectations. Surveying most boxing experts or analysts, most would concur the match-up between Wilder and Ortiz was 50-50 and each fighter possessed advantages that could secure victory. Both fighters had many questions to answer and both passed every test. Similar to the fight last year between Wladimir Klitschko and Anthony Joshua – featuring analogous backdrops, albeit slight differences; young unconfirmed champion vs. experienced skilled veteran, the young champion tested through the rigors of adversity and the young champion rising to the occasion, emerging victorious. The fight between Wilder and Ortiz featured various lulls and spots of low-activity, followed by high octane moments. Both fighters attempted various tactics throughout the course of the match and the lulls in action were due to the mental warfare waged between fighters. This was a game of chess and a battle of position, angles, adjustments and each pugilist attempting to land their best weapon. There was a series of back and forth between the two combatants, although it appeared heading into the final rounds the challenger held the advantage. Ultimately Wilder’s intangibles would hold serve as he secured victory via 10th round TKO in a tightly contested clash of titans. As Wilder alluded to in multiple post-fight interviews, both he and Ortiz can be proud of their performances. A well-deserved vacation, recovery and perhaps a shot against a title holder depending on what unravels within the upcoming months. Ortiz was well within the fight, arguably winning despite the scorecards from the three judges who had Wilder ahead and remains a threat to anyone in the division despite his age. Because Ortiz is older (38), it’s important to make the most of what he has left of his professional career, sooner rather than later. For Wilder, he answered many questions and continues to build his legitimacy as the no. 1 heavyweight. From a pop cultural standpoint, it’s fitting he wore the Black Panther inspired trunks. Play-by-play commentator Mauro Ranallo accurately referenced Wilder’s “Vibranium” chin throughout the telecast. And like the protagonist in the comic inspired action flick King T’Challa also known as the hero Black Panther, Wilder overcame adversity. T’Challa’s adversity was in the form of Killmonger and Ortiz – just as menacing, played antagonist in Wilder’s story. There are many Wilder detractors, claiming he has yet to fight anyone of note and that he’s a paper champion. Some critics may mention Wilder’s style and dissect and highlight his technical flaws. Is he flawed, sure. Name a fighter not flawed. But Wilder is technical to an extent and there’s a method to his madness. He works to further develop his craft and possesses a few intangibles that cannot be taught. From a technical standpoint, Wilder has a great jab; sharp, accurate, fast, powerful and multi-dimensional. Wilder utilizes the jab as a range finder. Although he could not use the jab as much as he wanted against Ortiz, mostly due to the southpaw stance and high skill-level of Ortiz. Wilder’s jab ties in with his accuracy. It allows him to line up powerful punches with his right hand. Boxing analyst Paulie Malignaggi details some of the aforementioned skills of Wilder and how it may display against potential opponent Anthony Joshua. Another underrated skill of Wilder is his control of range and distance. Combined with his athleticism, he can move and keep opponents at the range. Again, much of this was negated by the technically superior Ortiz, but Ortiz is widely recognized at the most technical fighter in the division. The easiest trait to recognize is his punching power. One-punch, change the complexion of a fight punching power. Drawing back to the fight between Ortiz and Wilder, the most important punch landed in the fight was a right hand counter from Wilder in the 10th round. As he was coming off the ropes he took a few back steps, slightly dipped at an angle, changing levels and baiting Ortiz with false illusion, in attempt to create an opening and the tactic proved successful. This is a tactic fighters utilize in attempt to create openings due to their opponent’s potent defensive skills. The intellect is there, the ability to adjust is there, rounds 7 through 10 reflect that. Which ties into to Wilder’s most important trait. His most important intangible is his mental strength. He has the utmost belief in himself (as do most high-level athletes) but he truly believes in victory regardless of circumstance. Wilder displayed the heart of a champion. Isn’t that what we want and ask of the fighters we watch no matter our rooting interests? This particular bout encapsulated a Rocky-esque movie and squeezed it into 10 rounds in Brooklyn over the weekend. As Wilder was visibly wounded and stunned in round seven, the pressure mounted as Ortiz closed in on what many saw an eventual victory. 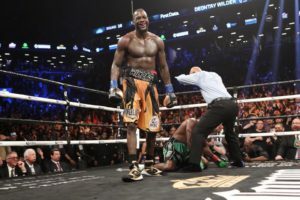 With the incoming onslaught, Wilder remained calm, composed, regained his strength in the ensuing rounds and closed the show a few rounds later. “I wasn’t hurt,” Wilder said regarding that tenuous seventh round. “I was in a whirlwind. I never thought Ortiz had power. I said that before. You know, he had me in that whirlwind and I was trying to get out of that tornado. You know what I mean? He put a lot of combinations together well. In contrasts to the misguided beliefs of esteemed trainer Abel Sanchez, from a viewership perspective, the Wilder lead telecast was a success. Especially if we considering the simultaneous airing of the HBO Boxing telecast featuring Sergey Kovalev, peaking at 674,000 viewers. #WilderOrtiz bout averaged 1.1M viewers and peaked at 1.2M viewers ? What’s next for Wilder? Unification is a goal mentioned on numerous occasions and Joshua is the main target. A major hurdle standing as road block on what can be boxing biggest bout since Floyd Mayweather and Manny Pacquiao, possibly surpassing the buzz and results of the recent Canelo Alvarez and Gennady Golovkin blockbuster is Joshua’s promoter Eddie Hearn. At least according to Wilder. “We’re ready on this side of the pond,” Wilder told BBC Sport. When or if the fight with Joshua manifests remains to be witnessed, we as fans can only apply the pressure towards the powers that be to demand this fight. The end goal for Wilder and for the boxing public is to gain some measure of clarity. In the age of alphabet belts, unification is rarely achieved, but an absolute way to deem who the best of the best is. Whether this feat for the heavyweight division is fulfilled by WBO heavyweight champion Joseph Parker, WBA and IBF champion Joshua, by the forgotten former unified champion who Steward famously prophesized or the main man Wilder himself, time will tell which legend unfolds.